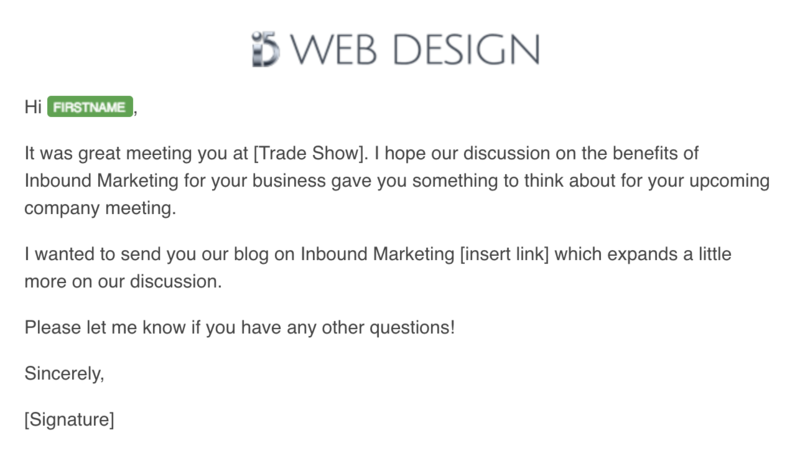 One of the biggest mistakes we see from companies at trade shows is the lack of follow up with leads after the show. Creating marketing strategies and materials for a trade show can be time consuming and the cost of attending a trade show can be high for a business. Don’t waste these resources by neglecting the important leads you acquire at your trade show! 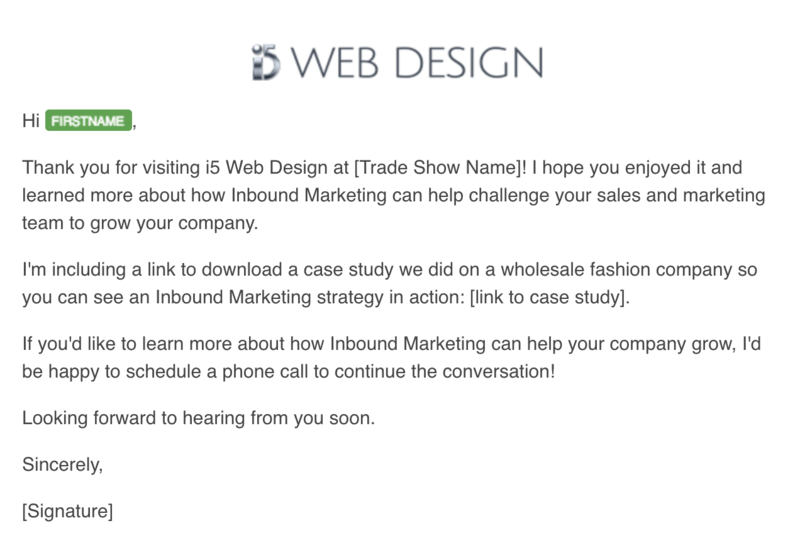 While following up with leads can be daunting, we created a few email templates to help you get started following up with trade show leads. We’ve discussed before the importance of having a plan to follow up with new leads after your trade show. This is an important part of your overall marketing strategy for the trade show. When you are following up with your new leads, remember that most sales require multiple points of contact and follow up communication before closing. As long as you continue to provide helpful and valuable information in your follow up emails, you will remain on your leads’ radar and increase your chance of closing the lead as a customer. What Should I Be Sending My Leads? If you have an automated email system, you can use it to communicate with your leads immediately after receiving their information. If you have created a landing page with a form for leads to fill out at your trade show, you can set an email to trigger upon submission of the form. Other trade shows allow you to scan an attendees badge to get their contact information, which you could push into a separate list and have an email sent directly to this list. A few days after your trade show ends, try reaching out personally to leads you met at the trade show. 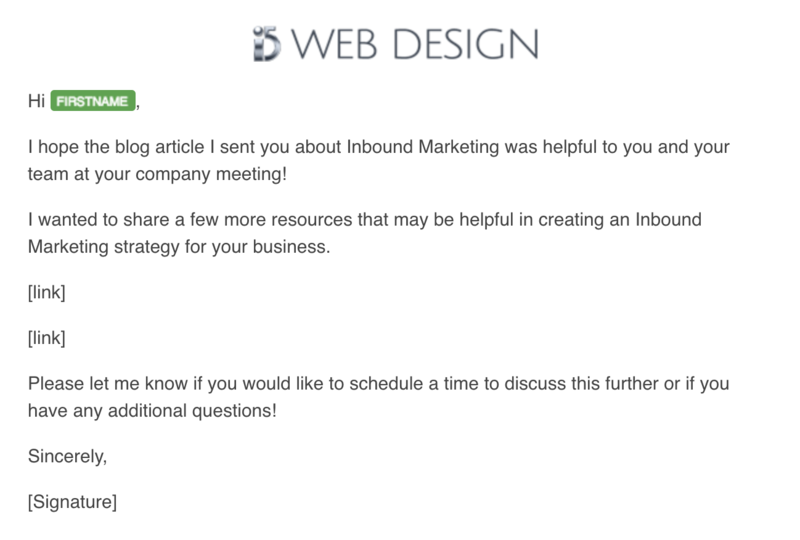 If you took notes on conversations you had with your leads or remember a specific story or anecdote from your conversation, you could include that in your follow up email. 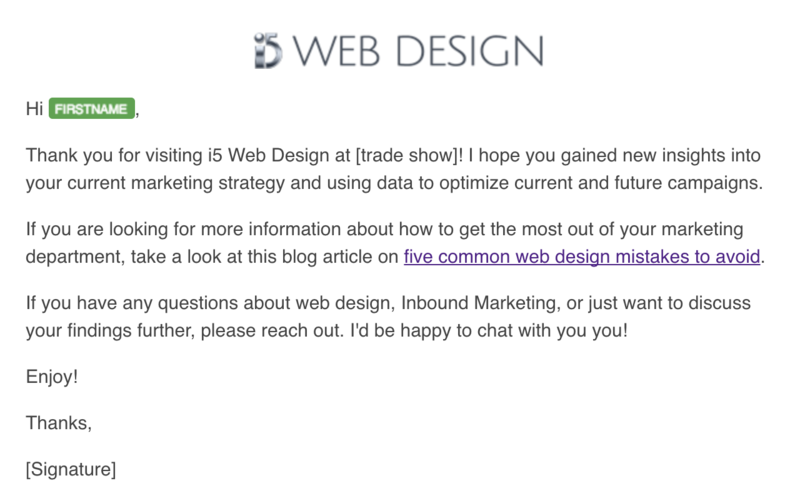 Try to make these emails a little more personal to each lead so they don’t feel like they are just being sent a mass email from a list. This will allow you to stand out from other companies and capture the attention of your leads. Creating a goal for your trade show will help increase results and leads. Download our trade show goal sheet to get started. Once you have made the initial contact with your trade show leads, your job is not finished! Most leads need multiple follow up conversations before they are ready to close as a customer. If you do not hear back from your first email, don’t give up hope! Try checking in with your lead to see if they have any questions about the resource you sent them following the trade show. 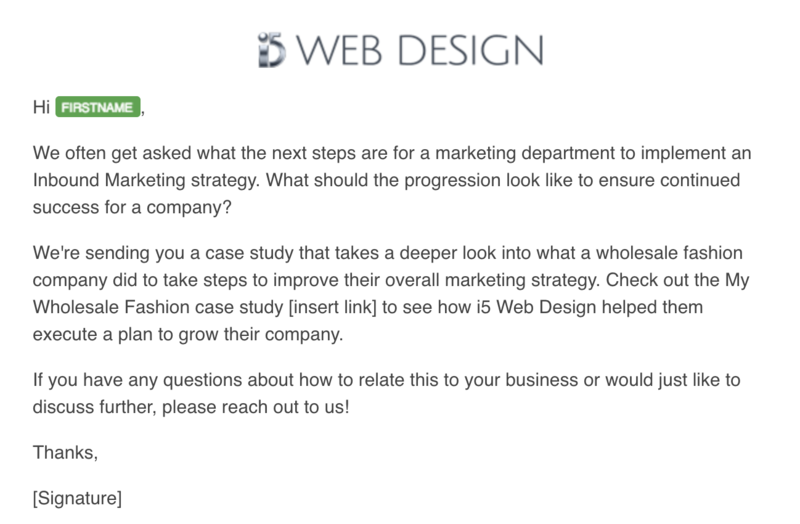 You could also try sending a follow up email with further information or resources for your lead to continue their progress through your sales funnel. Continue sending follow up emails or phone calls at reasonable intervals during the next few weeks following your trade show. Some leads you gain from a trade show may not be as interested in your product or services. In this case, sending them personalized sales emails may not be the best move as it could drive them even further away. In this instance, it may be beneficial to enter them into an informational drip campaign. This is different from your sales follow up emails because it does not focus so much on specific resources or setting up a time to talk. It instead just gives information that continues to build and slowly move them down the sales funnel without the added pressure of personal sales emails. As you can see, each email gives the lead information without being an actual sales email. They also progressively provide the lead with more and more detailed information and content to grow their interest. 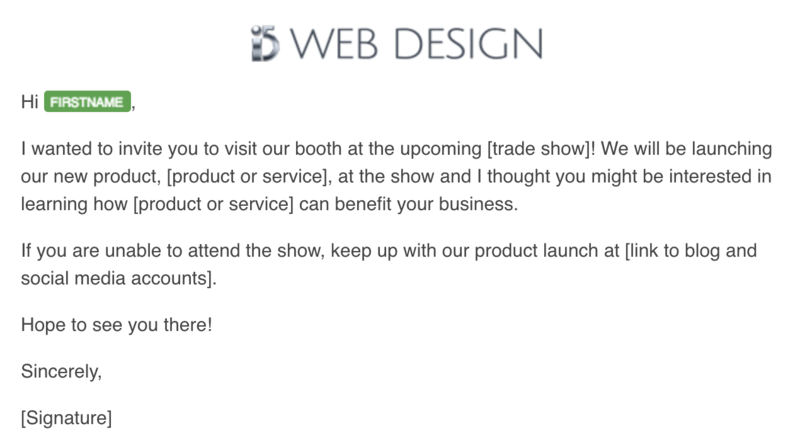 A final email you could send to leads from a trade show is to inform them of an upcoming trade show you will be attending. If you are debuting a new product or service at this show, it is a great time to contact leads from previous trade shows, especially ones who are interested but haven’t closed as a customer yet. The biggest thing to remember when following up with leads after a trade show is to not give up after one form of communication. Most sales take multiple points of contact before a lead will close as a customer. 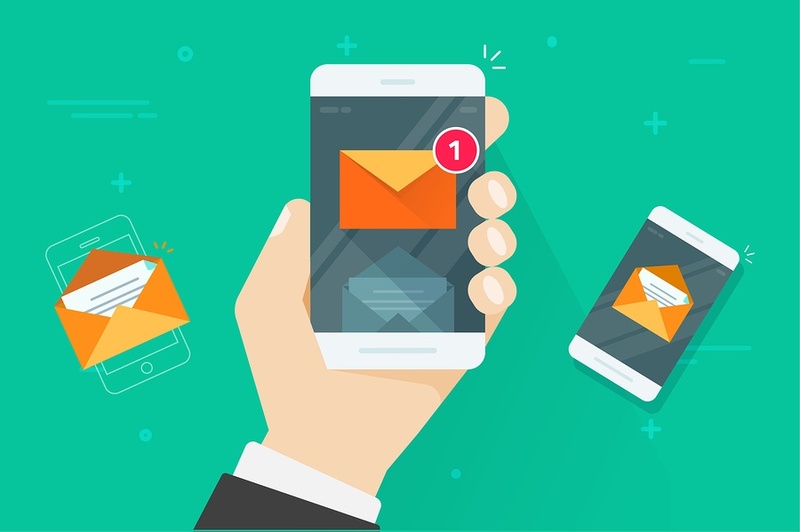 By using these email templates as a starting point, you should be able to maintain an open line of communication with your leads, which hopefully will culminate in them closing as a customer.